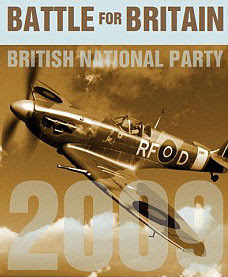 The British National Party has fronted its 2009 European Election campaign with a poster of a Spitfire. All very British. Give the Hun a bloody nose and then back to blighty for tea and medals. And of course, as it's the BNP, no foreigners. Except that the RF designation on this Spitfire means it came from 303 Squadron. Which was Polish. Genius.